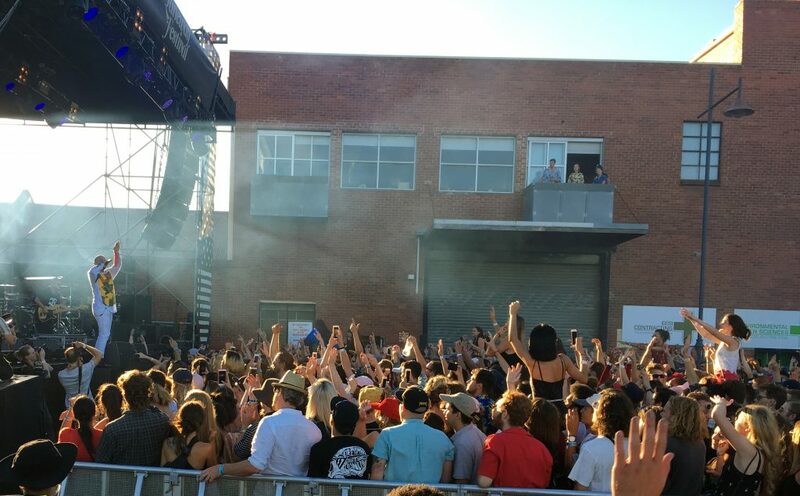 At a time when so many of the largest festivals have become all things to all people, Australia’s Laneway Festival continues to shun the mainstream in order to present fans with stellar lineups of artists much more on the edge. Typical Laneway crowds might be 15,000 and this traveling extravaganza hit six locations around Australia plus Singapore. I had my second Laneway experience in Melbourne on Feb 3. As with any similar event, one must choose when there are 40 different bands on 5 stages. Here are my highlights in the order I saw them. It was my second time seeing London’s melodic, punkish Dream Wife. They were good last May at The Great Escape in Brighton, UK and they’re really good now. Their self-titled album has dropped here in the US. Melbourne’s own Rolling Blackouts Coastal Fever showed why they’ve been snagged for this years Coachella and Primavera festivals. They blasted a large throng with their propulsive set that reminds of The Strokes and Parquet Courts, among others. I’ve been hearing great things about Sylvan Esso live and they delivered. With their big sound, one might be surprised to see they’re actually a two-piece. They had their crowd shaking their bodies. I’d seen Wolf Alice twice before, both times at B3Sci SXSW parties. They went from good to very good and now this is a band that is arena-ready. Look out for them as a significant headliner if their next album is another winner, and kudos to Mike and Troy at B3Sci on their foresight. I’m not much of a hip-hop guy but Anderson Paak was someone I really wanted to see based on live stuff I’d seen online. What a set! It varied from his straight-ahead hip-hop to his retro r&b to disco. Easily the most excited and largest crowd, and Anderson even played some drums. Mac Demarco added to the mayhem when he jumped onstage to do a handstand. This was the evening I got to finally cross Father John Misty off my bucket list. His powerful set was exactly as expected. Biggest surprise for me was Odesza, who played with far more drive and stage visuals than I anticipated. They even brought out a drum line a couple times, which people buzzed about for days afterwards. Pond played their usual high-energy show and showed us some excellent new tunes. Closing the main stage was The War on Drugs who justified that position with their ace and tight musicianship. Among the people I was sorry to miss due to inevitable festival conflicts: The UK band Shame who I heard put on a strong early afternoon performance. I’ve played them on my radio show along with Aussies The Babe Rainbow who also have a good reputation for their live show and I hated missing both. I’ve seen the massively talented Moses Sumney a couple times in LA and missed him here. Moses is another veteran of a B3Sci SXSW party where it was obvious a few years ago that he was on the cusp of a major ascension. Mac Demarco played three years ago when I was also on hand, and he was a top highlight. I unfortunately had to miss him this time around. I can’t recommend this festival enough for anyone having the chance to catch up with it next year. Laneway management, the PR people, and the staff on the ground are all top notch. Then there’s this lineup. Nowadays it’s rare to find such a stellar group with an indie focus, all playing in one day. Anderson Paak played a set that transcended the hip-hop genre and was real hard not to love. Photo: Andy Hazel. Ten Fe were one of the top live bands at The Great Escape 2017 and are on the verge of their first US shows including Bonnaroo, NY, LA, SF, and Philadelphia. Hear them talk about their music, their UK busking to raise funds, their thoughts on the US, and more.